Onsite training at your own offices can work out considerably cheaper than public open training events, especially if you have two or more staff to train. Traditionally, computer training was normally carried out at public centres and colleges. Whilst this may be an appropriate solution for individuals, if you are a Company looking to up-skill several staff members it can work out both expensive and inconvenient. Our onsite group rates will make your training budget go further, whilst delivering a more personal learning experience. Please note that these are the total costs per group, not per delegate. For example, if you have 10 employees to train, you can see that the cost per person equates to just £55. All rates are + VAT. 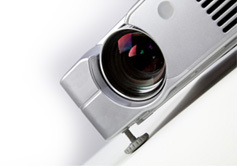 We bring all the necessary training equipment, including a projector and screen. If required, we can also provide laptops for each delegate, so that you can use any suitable office for your training. These are supplied at a daily rate of £15 each. If you would like assistance in choosing the correct level of training for your staff, we can provide a free Training Needs Analysis service. This consists of a simple tick-box Word form which we would invite each delegate to complete. The forms can then be emailed back to us and we will then advise on the most appropriate level of training. To enquire about a Microsoft course at your offices, please use our Contact Form. Alternatively you can call us free on 0800 9055142.